Brown is the combination of many colors which combinedly resemble wood color, coffee color, chocolate color etc. There are few shades of brown starting from darker ending to lighter shades. It is a composite color consisting of red, yellow, blue. This color is found in nature in many things namely hazelnut, cocoa, wood, soil, hair color of human and animals etc. Brown nails are favorite to the girls because of the natural look of them. This color suits almost every shape of the nails. 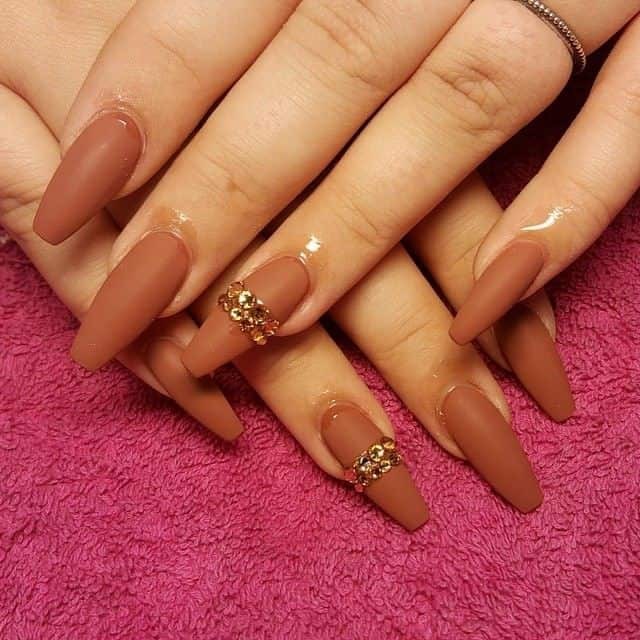 I am going to discuss some ideas of brown nail designs for you in this article. There are hundreds of ways to have brown nails. You can modify each design as per your choice to invent a new design. But, having some ideas will help you design the nails appropriately. That’s why my endeavor is to enlighten you on the best ideas available about brown nail designs. Have a read of the whole article for further knowledge. Paint your nails with brown color then use white colors to draw polka dots on them. These nails look beautiful on the nails. Gold glitters can be used very effectively to design brown nails. These dark brown glitter nails look awesome. White nail art looks stunning on brown nails. At first, paint the surfaces of your nails with brown nail polish then draw the floral pattern with white color. Matte brown nails can be a beautiful companion of your everyday look. You can paint your nails with different tones of brown color then place some black stones on them. Sometimes, just a ring can enhance the beauty of your nails. Paint your nails with brown color and draw some golden patterns on them. A ring on the ring finger will complement the brown nail design for short nails. I am not talking about brown almond nuts, it’s about brown almond nails. Almond nails are the most beautiful nails and you can accentuate them by using a different pattern on only one nail of each hand. These deep brown nails look outstanding. You can add some glitters to the brown nails to make them look unbelievably beautiful. Paint all your nails with brown color. Then paint only one nail with some other colors to have brown nail designs like this one. Cappuccino is very favorite most of the girls. If you are a desperate lover of cappuccino you can paint cappuccino designs as brown nail designs. This design is very interesting. The nails are painted in a manner that there is a gradient order of brown color. The nails are resembling different shades of brown colors ranging from dark one to light brown nail. You can use rhinestones and glitters to add glam to any nail design. Brown nails are not an exception in this regard. Use rhinestones and glitters to make the nail shine brighter than before. Brown nails look great having a pink nail in between them. This design is simple yet delicate. Paint all the nails with brown color keeping one in pink. Then draw a brown floral design on the pink base to have such brown nail designs. Black nails painted with white and brown spots can make the nail look chicer. Paint some brown polka dots on the black base of your nails while having brown nail designs. If you are a shine lover you can have this design. 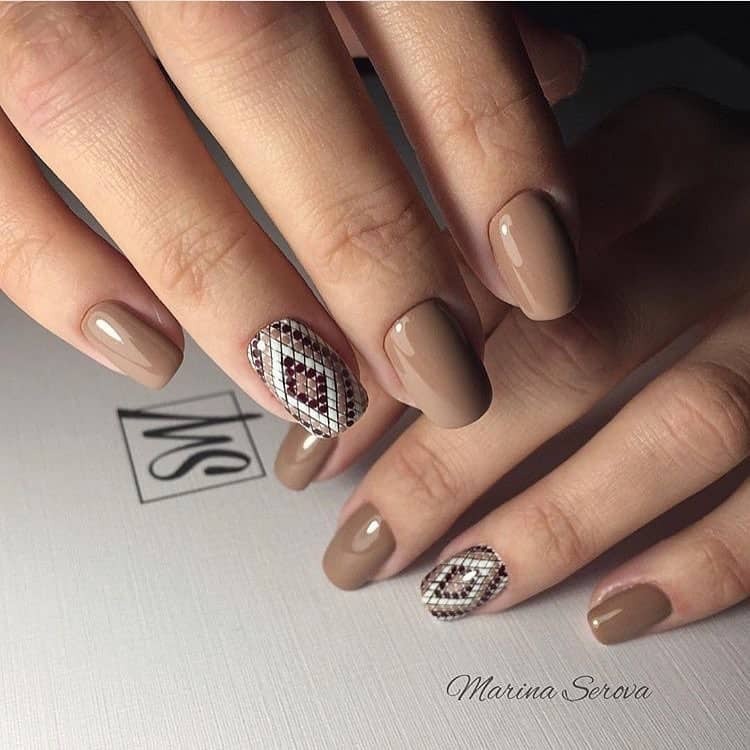 Glitters and rhinestones have been used for these brown nail designs. 3D nail art is becoming popular these days. 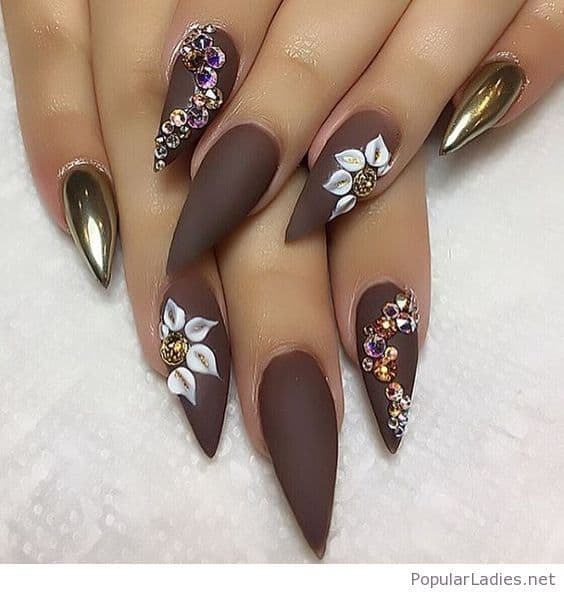 You can paint your brown nails with 3D floral art to have this type of brown nail designs. This is the simplest form of nail art. No exaggeration, no complexities, just keep it simple and tidy. Paint all the nails with brown nail polish. Sometimes, nail design looks incredibly beautiful in congested nail designs. This design is the perfect example of how an accent nail can change the whole look of brown nail designs. This design is so eye-soothing. You can have smooth designs like this only at a good salon. So, check the place where are you having your next manicure. Ballerina nail itself is beautiful. The shape is so attractive that you don’t need much beautification for these nails. You can attach extra shiny stones or glitters to the nails to make your brown nail designs look luxe. This design is so elegant that your nails will look rich in this design. Use gel nails for the best output. The shiny and glossy look is giving a bold statement. You can have true elegance painted on your nails as brown nail designs. Brown nails look beautiful if they are designed in the right ways. You can follow our websites for the guidance you need. I have discussed only brown nails in this article. Hope you’ll be inspired by them and try them out on your nails.